For more than 100 years, Anderson Public Library has been improving the quality of life for the communities of Anderson and Lapel, Indiana. APL stays on top of their community members' information needs—whether it's found online or on a shelf. The Library leadership believes that a useful library website is a vital service to their patrons. Anderson Public Library shares a common set of challenges with many other library websites. 1. 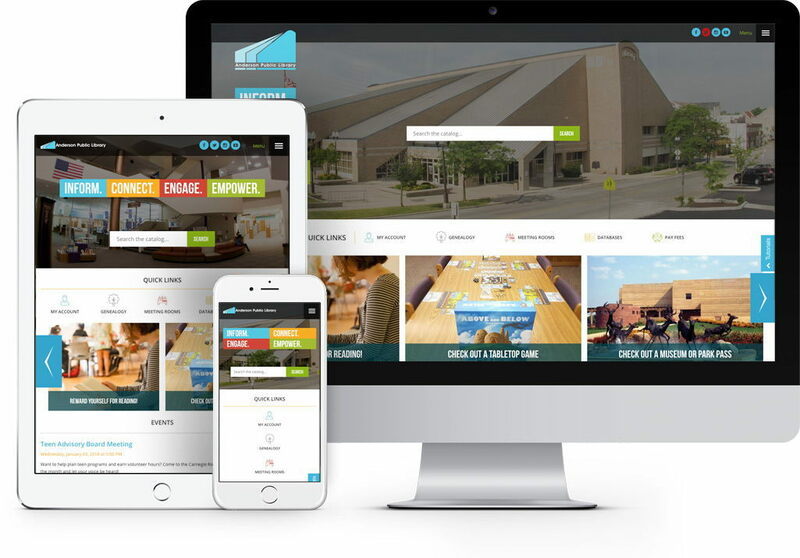 Connect a wide array of third-party tools and resources, like the catalog, online databases and the events calendar. 2. Organize a massive amount of content in a way that makes it easy for users to navigate. 3. Help patrons do as much as they can online, from account access and paying fees, to research and event registration. We designed and developed APL's previous website, and they came back to us when it was time for an update. The landscape of digital services for libraries and the tools that libraries can connect to their website are constantly changing and expanding. We organized the content in a very different way this time around, based on user feedback and our own recommendations for enhanced usability. We incorporated better search functionality into the homepage design, and gave the website a fresh look. We also built the website on a new CMS platform to give website managers more tools and flexibility. Website users want to search the catalog and login to their account. We built the homepage so that these two priorities are easily found. The search bar is built into the main feature area of the homepage and connected to the third-party catalog search. My Account is the first link in the Quick Links area. We built flexible CTA modules to make it easy for website managers to update content. Homepage CTAs link to items of note or special events, and the Events area of the homepage is populated automatically with details from the library's third-party calendar and events platform. One of the most challenging aspects of a library website is organizing the content. We created a top-level section of the website called Read, Listen, Watch, Play and built a directory for easy behind-the-scenes management of online resources, catalogs, and types of materials. The off-canvas menu makes it pleasantly intuitive to browse by types of materials, like Audiobooks, eBooks, or Music. 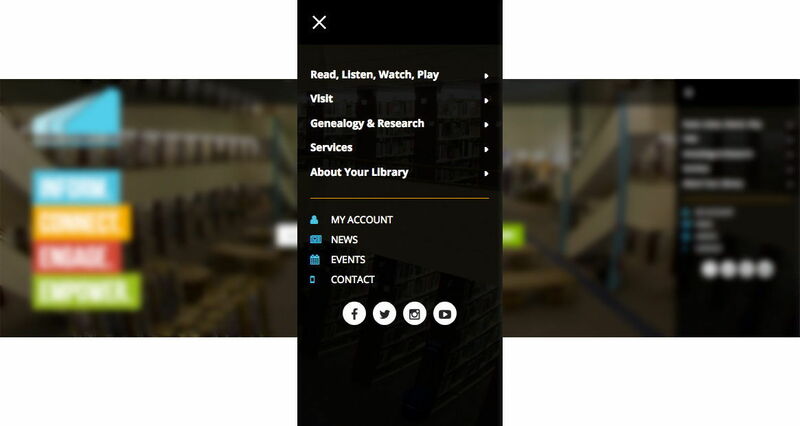 Experience the library's new website for yourself!